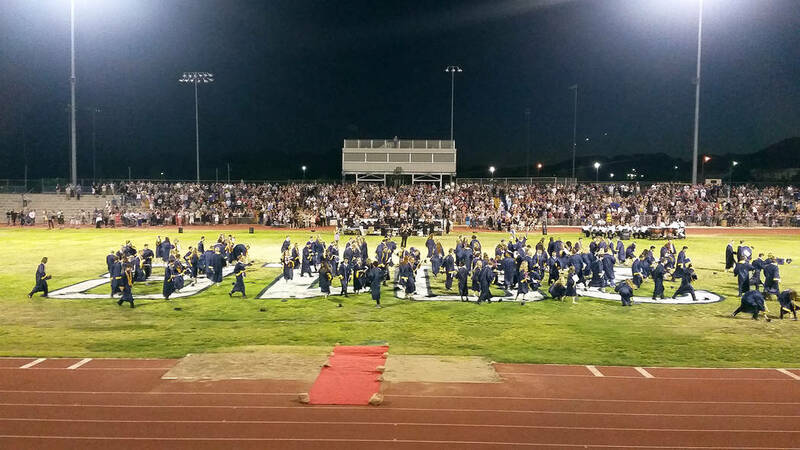 Boulder City High School held its 77th annual commencement Friday, May 25, at Bruce Eaton Field, and 145 seniors graduated and moved on to the next steps in their lives. Celia Shortt Goodyear/Boulder City Review One of Boulder City High School's newest graduates, Gabriel Lawrence, center, celebrates with his family, from left, Will Anderson, Valaree Anderson, Nolan Anderson and Brad Anderson, after the school's ceremony Friday. 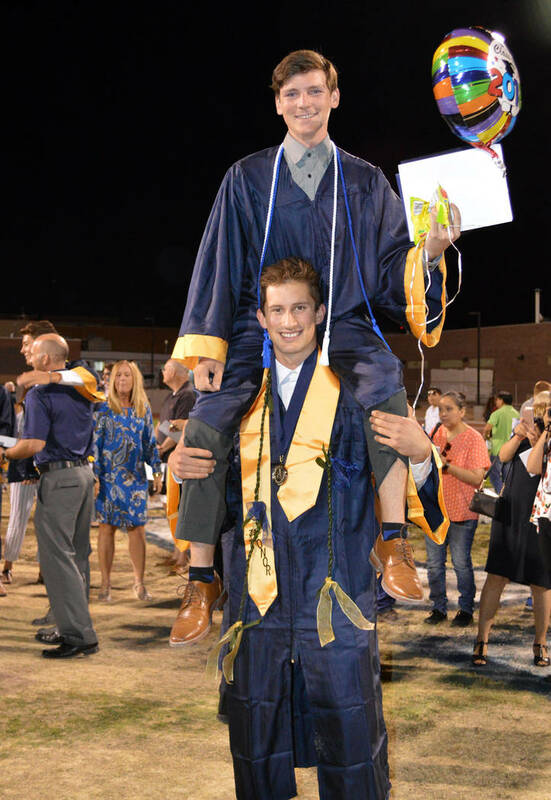 Celia Shortt Goodyear/Boulder City Review Bryce Rogers, top, celebrates graduating from Boulder City High School on Friday with his friend and fellow graduate Sam Oberto. 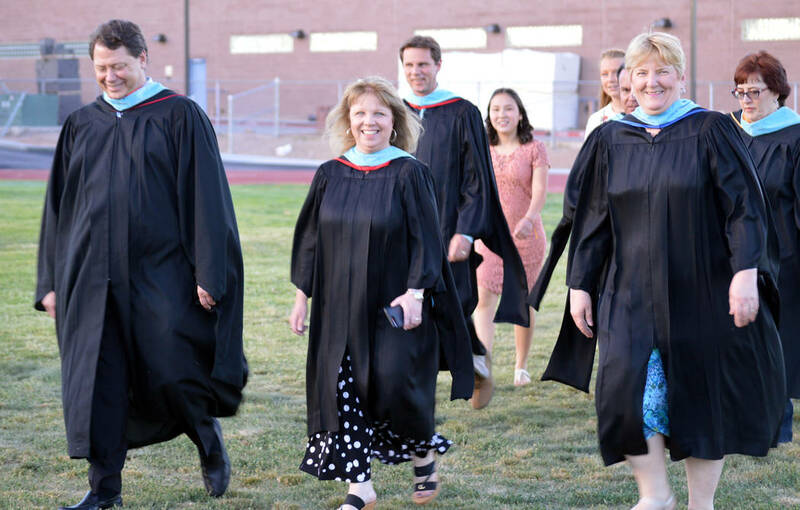 Celia Shortt Goodyear/Boulder City Review Boulder City High School Principal Amy Wagner, center, leads Clark County School District Superintendent Pat Skorkowsky, left, and Garrett Junior High School Principal Jamey Hood, right, to Bruce Eaton Field on Friday for graduation. 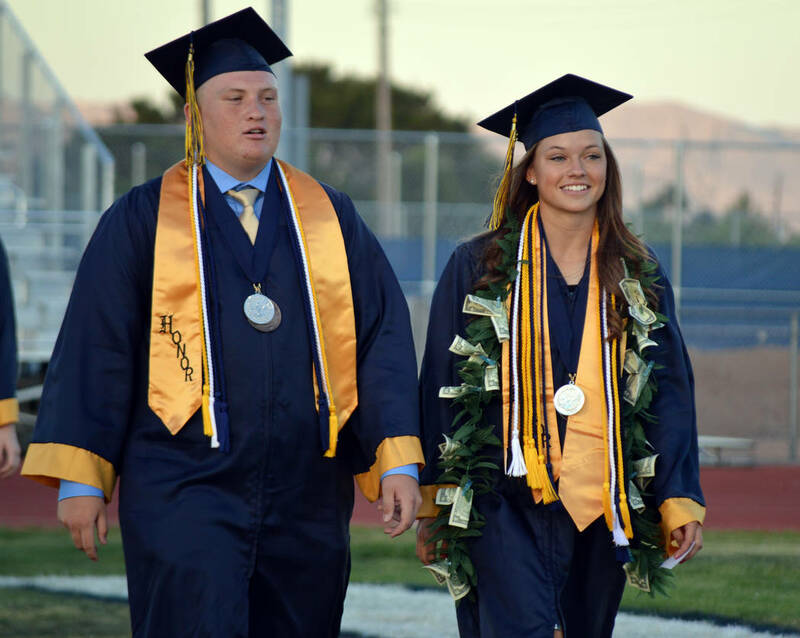 Celia Shortt Goodyear/Boulder City Review Graduating seniors Nolan Herr and Lani Potter walk onto Bruce Eaton Field on Friday for the school's 77th commencement. 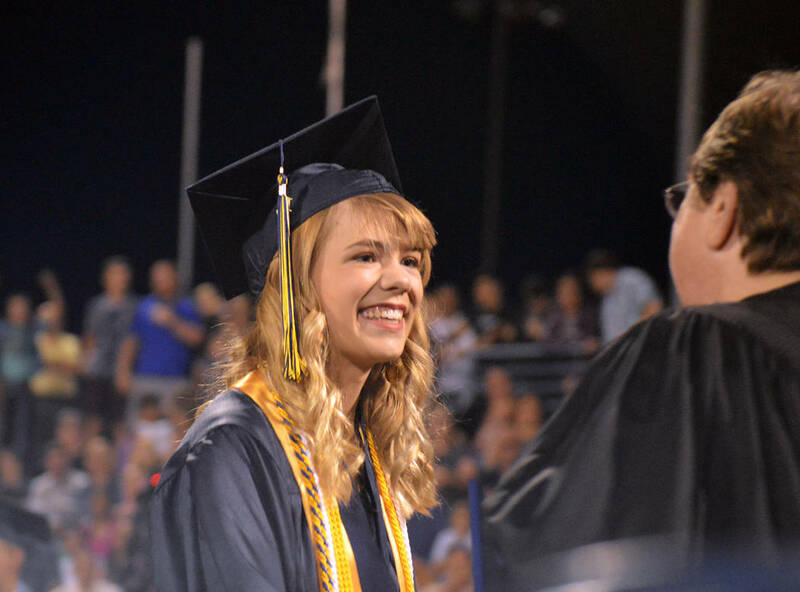 Celia Shortt Goodyear/Boulder City Review Lauren Stewart accepts her diploma Friday at Boulder City High School's 77th annual commencement. Celia Shortt Goodyear/Boulder City Review The Boulder City High School class of 2018 throws their caps at the conclusion of the graduation ceremony Friday at Bruce Eaton Field on the school's campus. 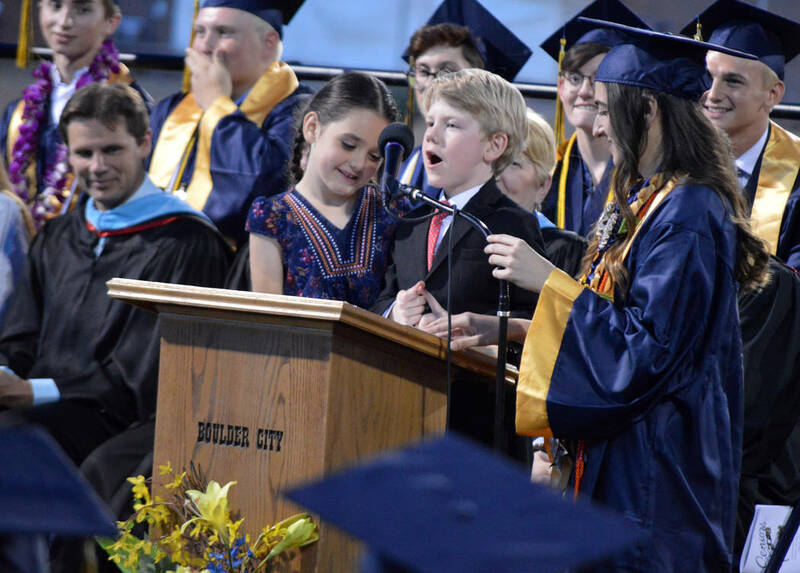 Celia Shortt Goodyear/Boulder City Review Members of the class of 2030 Elizabeth Sargeant and Gary Wentz share some advice with the class of 2018 at the graduation ceremony Friday at Bruce Eaton Field. The ceremony featured speeches from the class of 2018’s five valedictorians and one salutatorian. Salutatorian Sean Garner told his fellow graduates that the true test of character comes when they are in the valley and that the next time they find themselves there they should ask themselves how they can rise higher. Valedictorian Camille Torgesen reminded her classmates of the good times they had in the midst of their hard work. Valedictorian Kirsten Lowe congratulated her classmates for making it through high school and reminded them to count every achievement and focus on what they could do for their futures. Valedictorian Erica Snow said that each of the students was completing a journey of discovery and they should look at the positive parts of what could seem like a difficult decision. Valedictorian Clayton Pendleton thanked his coaches for the impact they’d had on him during high school. “I learned that it takes hard work and grit to be successful, even if it hurts,” he said. He also thanked the teachers, counselors and other staff at the school for their work in his life. “Thank you. … We wouldn’t be here without you,” he said. It was also a time for the graduates’ families to reminisce and join in the celebration. Hannah’s brother, Billy, a 2013 graduate, was also there for the graduation. Longtime Boulder City resident and Boulder City High School alumnus Mike Pacini was there and excited because his son, Vinnie, was graduating. 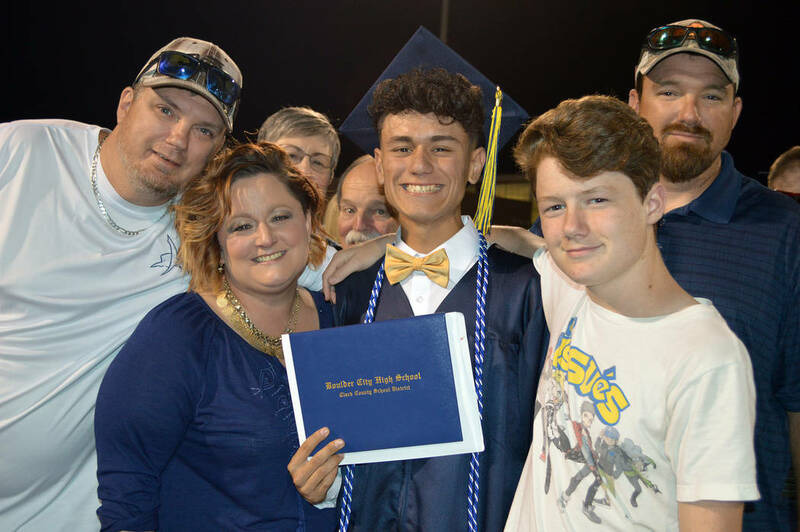 Valaraee Anderson’s son, Gabriel Lawrence, graduated on Friday, and she was thankful that they had relocated to Boulder City from Mississippi in 2005 after Hurricane Katrina.